For my English 5350 graduate course we were assigned to do a review on at least two of the graphic novels that we have read for class. I was lucky enough to get one that is truly very gripping. 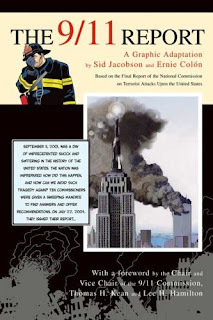 THE 9/11 REPORT: A GRAPHIC ADAPTATION is a graphic novel based on the final report of the National Commission on Terrorist attacks Upon the United States. The authors of the novel are two names which are not new to the comic industry, Sid Jacobson and Ernie Colon. Similar to what the foreword of the graphic novel is explaining, an article in the New Yorker states that although the 9/11 Commission Report became a best seller, the way that it is laid out will not reach a diverse audiences and that is why the adaptation of the book into graphic novel format was greatly need (Singer, 2008). That is exactly what Jacobson and Colon did by creating a graphic novel based on the event that took place on the tragedy that took place on September 11th, 2001. From the standpoint of someone who is familiar with the situation only through what was heard from surrounding people or from occasionally clips seen on television, this graphic novel is a great way to learn about what truly happened on 9/11 and on dates closely surrounding 9/11. The creation of this graphic novel is all around great. The creators give so much detail in this rather small graphic novel. At the beginning of the novel the creators tried and in my mind did a pretty good job of developing a time line of what was going on at specific times in the four airplanes that were hijacked. As mentioned above, the novel presents its readers with different situations that surrounded and probably lead to the tragedy on September 11th, 2001. As a reader you wonder why the government didn’t do things differently to try to better prevent the tragedy from happening. Not only because of how greatly informative this novel is, but also for its fantastic graphics which catch the attention of so many young adolescents this is definitely a book that needs to be incorporated into today’s schools’ curriculum. I feel that this graphic novel can fit into many different subjects, but because the fact that I hope to be an English Language Arts Teacher, I tried to think of ways in which THE 9/112 REPORT: A GRAPHIC ADAPTATION could fit into a Language Arts class. One way that is obvious is doing a lesson based on vocabulary. I feel that this is a good idea mainly because of the immense amount of intense vocabulary. Another way that a teacher could use this is by teaching about visual representation and visual interpretation. One could ask there student to develop a graphic novel on an important event that has taken place in their own lives. Another idea of how this could be incorporated into the a classroom is if you are basing your instruction on tragic events this would be a perfect novel to teach about 9/11. I believe that the creators of this graphic novel did such a good job that it could be used in so many different ways and that is another thing that makes it so great.